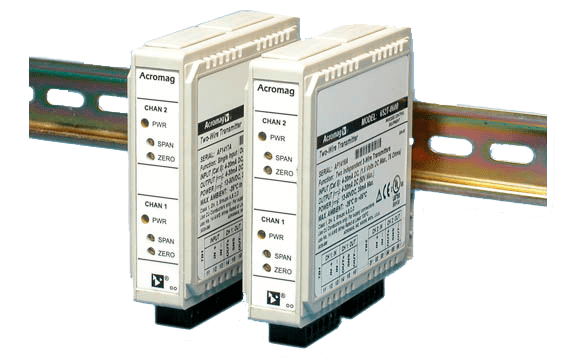 These units receive 4-20mA process current inputs and provide isolated 4-20mA output signals .Each channel operates independently and is isolated from the others to prevent interaction between channels. • Signal splitter model (653T) provides two identical outputs from one input signal . • Galvanic isolation eliminates ground loops, reduces noise, and blocks transient signals . • Power LEDs provide a visual indication of operational process loops . – 4 to 20mA input (each channel). – Voltage drop (651T, 652T): Less than 1 .5V, typical (75 ohm equivalent). – Voltage drop (653T): Less than 3 .0V, typical (150 ohm equivalent). – 4-20mA DC output (each channel). – Outputs are limited to 36mA . point linearity and adjustment resolution . test conditions .This specification includes the combined effects of zero and span over temperature . – Two 15-turn potentiometers (zero and span) per channel, accessible from front of the unit . -3dB at 45Hz, typical . – For a step input, the output reaches 98% of output span in 15mS, typical . – Common mode: 100dB at 60Hz, typical . – Normal mode: -5dB at 60Hz, 100 ohm source, typical . – LED power indicator: Off for output open loop detection, power, or load compliance problem . current during field maintenance . – 12 to 50V DC for each output channel . – Complies with EN61000-4-3 Level 3 (10V/m, 30 to 1000MHz) and European Norm EN50082-1 . – Complies with EN61000-4-5 Level 3 (2KV) and European Norm EN50082-1 . – Electrical Fast Transient (EFT) Complies with EN61000-4-4 Level 3 (2KV) and European Norm EN50082-1 . Optional terminal block kit, barrier strip style, 2 pcs . Holds sixteen 650T transmitters .